It's been a bit of a mixed bag, on the whole. While I caught up with a number of my all-time favourites - including The Shining, Fargo, Drive, This is Spinal Tap and American Psycho, very few of the films I was watching for the first time left much of an impression. An exception to that general rule was the disturbing but fascinating Compliance, a film based on a horrifying true story. The premise of the picture (and the real life events which inspired it) involve a hoax caller ringing a fast food joint and pretending to be a police officer. The caller informs the manager of the restaurant that one of her members of staff (in this case, a young woman named Becky) has been accused of theft, and must be detained so that the police can make an arrest. Once the member of staff has been taken away from public view, the caller uses his assumed authority to pressurise the manager into treating the detainee in an increasingly degrading manner. Where this film is so strong is that all of the events are presented in a straightforward manner, without any form of sensationalism; the true horror of the events speak for themselves. Special praise should go to the acting performances of Ann Dowd (the manager of the fast food restaurant), Dreama Walker (Becky, the detainee) and to Pat Healy, who plays the hoax caller as a sinister and inscrutable individual with an icy detachment from the mayhem which he is creating at the other end of the phone. It's not an easy film to sit through, but it is absolutely compelling nevertheless. Two candidates present themselves for the dubious honour of the worst film of the week. First up, we have Abel "Bad Lieutenant" Ferrara's King of New York. It's a violent gangster picture in the vein of Carlito's Way, with a former mobster returning to his former life after a lengthy prison sentence, determined to get even with those who wronged him while he was away. 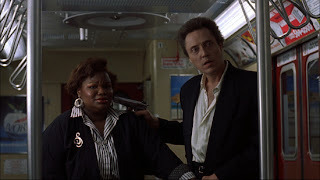 Despite a typically wild-eyed and captivating lead performance from Christopher Walken, the plot of the film is all over the place, the fashions and music on display have aged horribly and it bears little or no resemblance to real life. Secondly, Alfred Hitchcock's The Birds, probably the most disappointing picture I've seen from the master director. I guess the main problem from my perspective is with the special effects Hitch used to create the illusion that a gang of irate seagulls had descended on the unsuspecting townsfolk of Bodega Bay, CA. 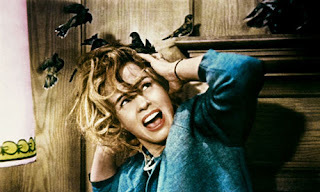 It's obvious that the actors were never in the same room as the swarms of birds, so I was never really scared by any of the numerous scenes of avian attacks. (Obviously, the effects are still roughly six million times better than the animated GIFs you see in Birdemic: Shock and Terror). Compounding this problem is that I was rather bored by the tedious romantic subplot involving Melanie Daniels (Tippi Hedren) and Mitch Brenner (Rod Taylor). Possibly because Hedren is no Grace Kelly - and Taylor is no Cary Grant - I never found myself warming to these characters, and I never felt like I had anything invested in their fates. 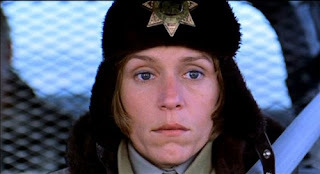 "Marge Gunderson: So that was Mrs. Lundegaard on the floor in there. And I guess that was your accomplice in the wood chipper. And those three people in Brainerd. And for what? For a little bit of money. There's more to life than a little money, you know. Don'tcha know that? And here ya are, and it's a beautiful day. Well. I just don't understand it."